Are you ready for game day? 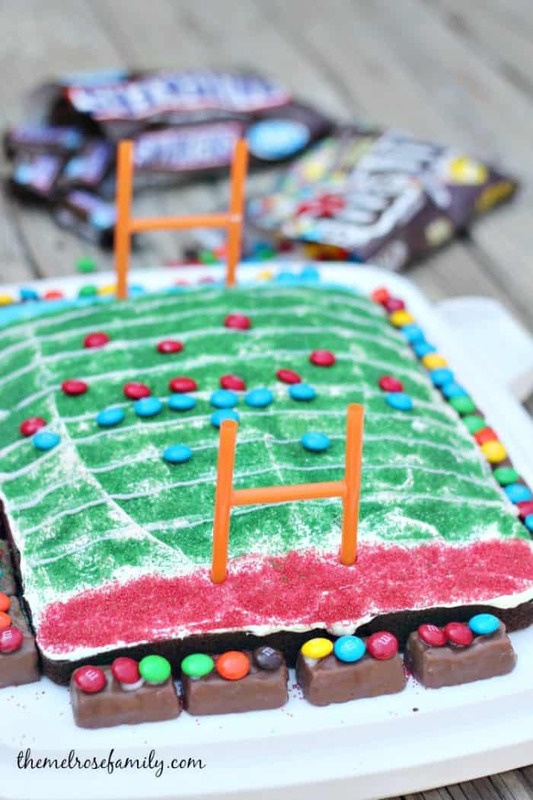 You don’t want to forget about dessert and this Football Stadium Sheet Cake is sure to be a crowd pleaser. Any time we are planning our menu for game day, we always seem to forget about dessert. Not anymore! This cake uses minimal ingredients and takes less than ten minutes to decorate. This post was sponsored by M&M’s and Snickers. My two little girls love their sweets. They especially love their candies. 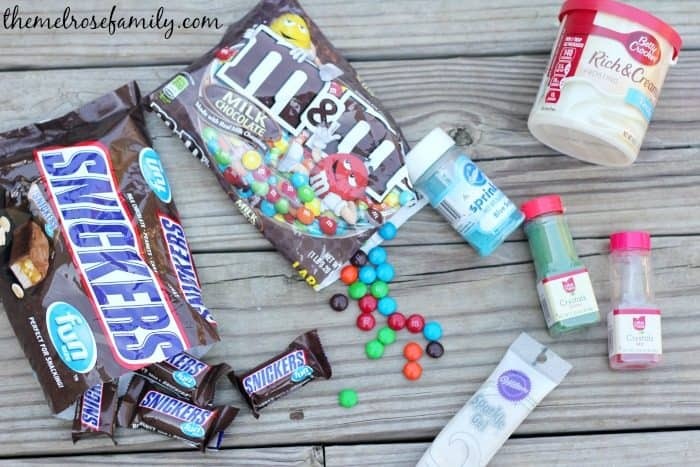 We even potty trained my youngest by promising an M&M every time she went potty. It worked like a charm too. I recently introduced my girls to Snickers and my oldest daughters eyes lit up when she bit in it. It was all I could do not to say to her, “Oh, mama knows!” All Mars candies are a huge weakness for me , but Snickers are the worst. 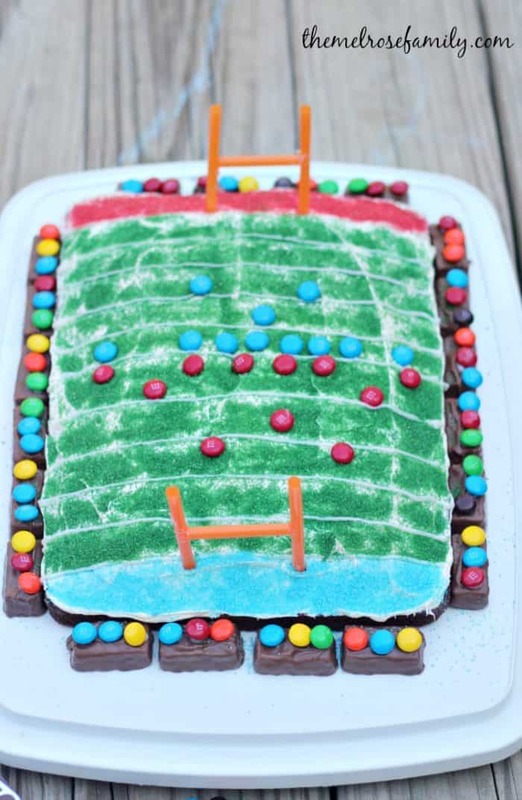 They make the perfect bleachers for my M&M crowd though in this Football Stadium Sheet Cake so I gave in to the temptation and included them. I would be remiss if I did not admit that several of the bleachers went missing prior to decorating the cake. What?! What’s a mama to do?! I used red and blue M&Ms as the players in the correct offensive and defensive formations. The spectators were also represented by M&Ms sitting on Snickers bleachers. 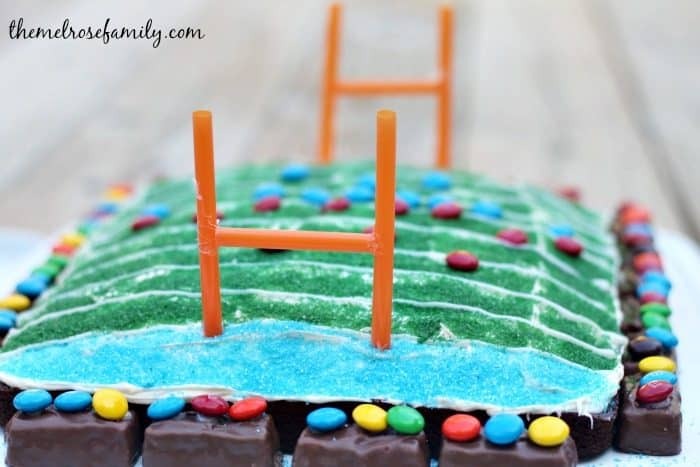 I secured the M&Ms to the Snickers with Wilton Sparkle Gel, which I also used to create the yard lines on the field. I lined up the teams at the 50 yard line and made sure that they were lined up properly. Can you tell who’s on offense? It’s the blue team, but I totally had to Google how they would line up so don’t think I’m that good. I watch football constantly, but I’m not really watching it. It’s on for my husband while I’m on Pinterest looking for my next creation. We’re both doing what we love so that’s what matters right? For my goal posts I simply cut three straws into pieces and hot glued them together. They were the perfect size for the cake. Plus, they fit underneath the cake carrier so they didn’t get damaged while I stored it. For the cake I used chocolate cake mix so that when my girls got their slice of cake it looked like the dirt of the field. The frosting was vanilla with blue and green sprinkles in order to color the grass. Using the sprinkles made it so much easier than trying to add food coloring to the frosting. Plus, who doesn’t love sprinkles? The entire cake was a huge hit. From the players to the spectators I had everyone oohing at the cake. 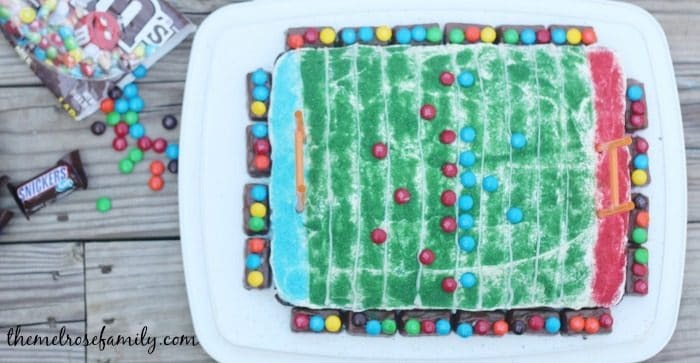 The best part though is that you can get all the supplies for our Football Stadium Sheet Cake at your local Target. Be sure to use your Cartwheel Offer for additional savings. Wow, this cake is so cute, Jenny!!! Love it!! !